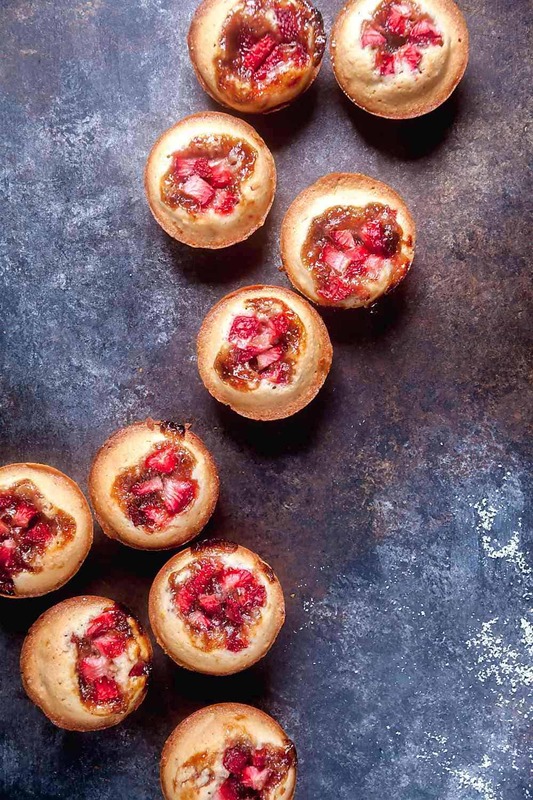 Gluten Free Strawberry-Rhubarb Financiers | Healthy. Delicious. 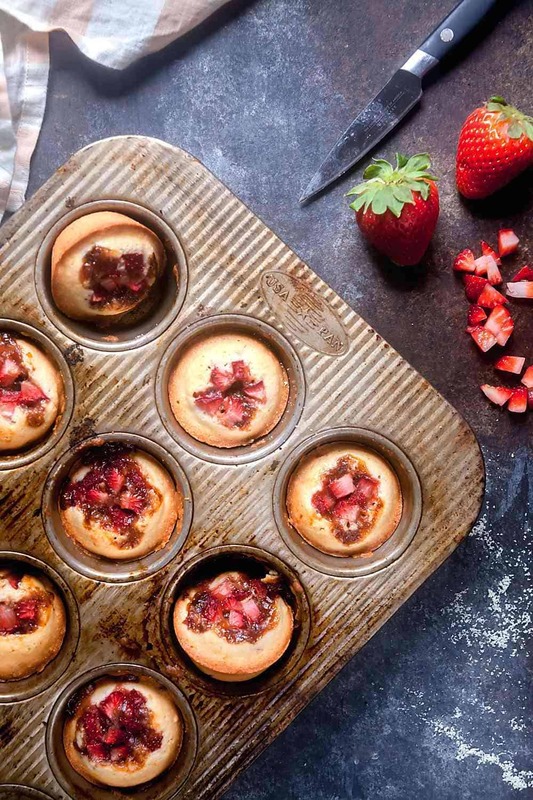 Gluten free financiers topped with strawberry-rhubarb preserves and fresh strawberries are a great baking project for a rainy spring day. They’re great for everyday snacking or for events like bridal showers! This post was sponsored by Boscov’s. Thank you for supporting the brands that keep me inspired in the kitchen. Remember when I said I went to four different stores looking for rhubarb last weekend? 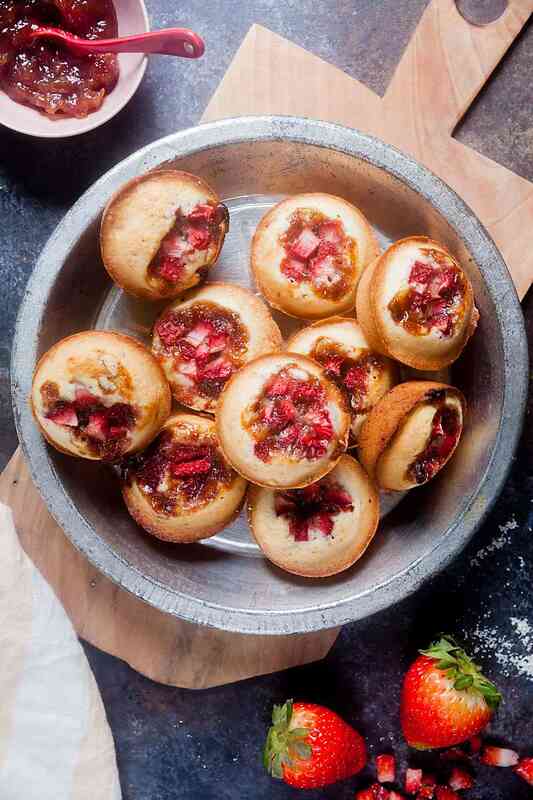 It was for these strawberry-rhubarb financiers. Once I got the idea to make them into my head, I couldn’t give it up. Although my grocery escapades didn’t go quite as planned, I still had a fantastic shopping weekend. Boscov’s was holding their semi-annual VIP event so I swung by the Colonie Center location to check it out. The event is described as “Black Friday for housewares” and they weren’t kidding! You might have seen on my instagram stories that the store was packed with brand representatives, demos, and samples – and some of the best deals on housewares I’ve seen. I scooped up this gorgeous silver Kitchen Aid mixer, along with a glass bowl, for less than the mixer itself would usually cost. It looks so pretty sitting on my counter, and I’m really excited about having an extra bowl to use with it. 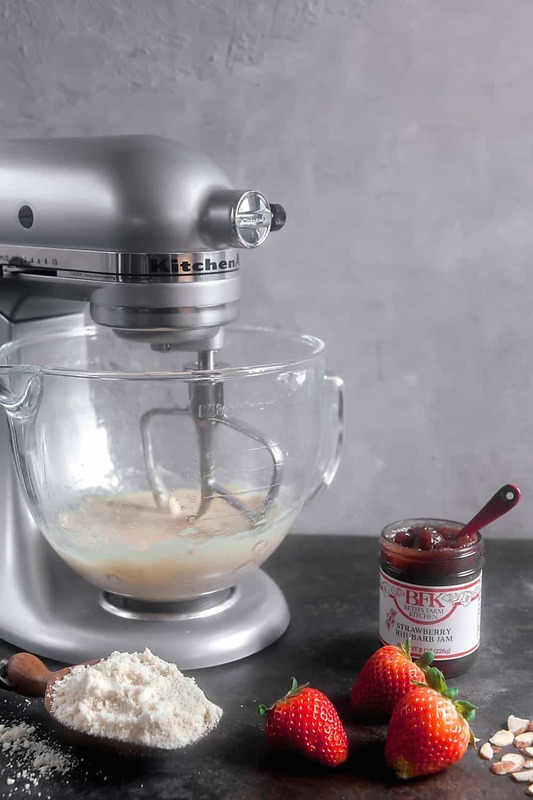 I’ve been doing a lot more baking lately now that I’ve been experimenting with gluten free and paleo recipes, so I foresee this mixer getting a ton of use. I also ordered the spiralizer attachment from the Boscov’s website because sweet potato noodles without the arm workout seemed like too good a deal to pass up. I was excited to break the Kitchen Aid in as soon as I got it home, and these gluten free financiers were the perfect way to do it. Financiers are small French cakes with a crisp exterior and a moist center, similar to a madeleine. They remind me of a cross between a cookie and a cake. They’re usually made in a special rectangular shapes mold, but a plain old muffin tin works just as well. Since financiers are typically made with a predominantly nut flour base, it wan’t difficult at all to adapt them to be gluten free. 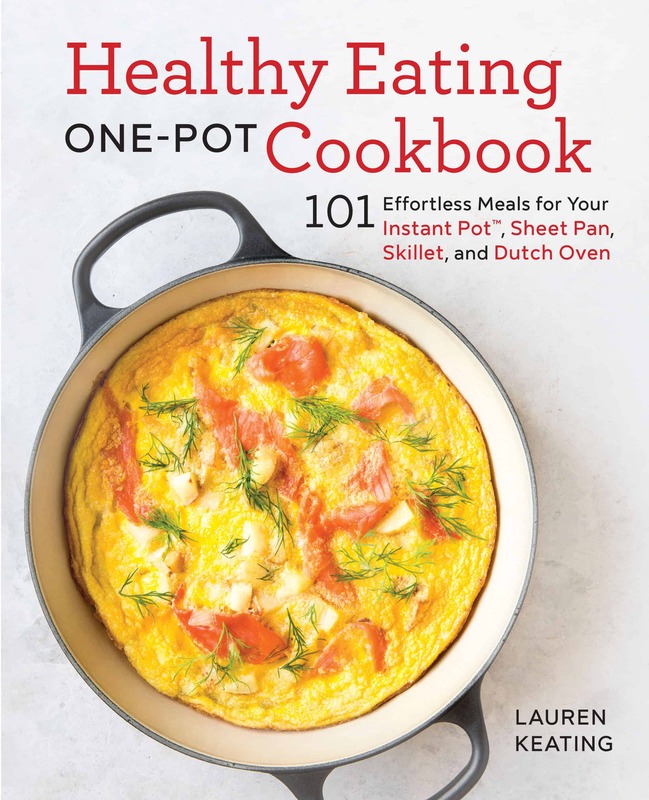 I just swapped out the wheat flour for an all purpose paleo blend. Since the amount of flour in financiers is so small, it was easy to just do a one for one swap. I topped the cakes with a dollop of strawberry-rhubarb preserves and some chopped fresh strawberries. I really like the contrast of both the sweet-tart and jammy-fresh flavors. Using strawberry-rhubarb preserves instead of just strawberry gives them a deeper, more nuanced flavor that works really well. Tart cherry preserves would also work really well. Heat your oven to 350ºF. Grease a 12-cup muffin tin with butter or nonstick spray. Melt the butter in a small saucepan set over medium heat. Cook several minutes, until the butter foams and turns light brown. 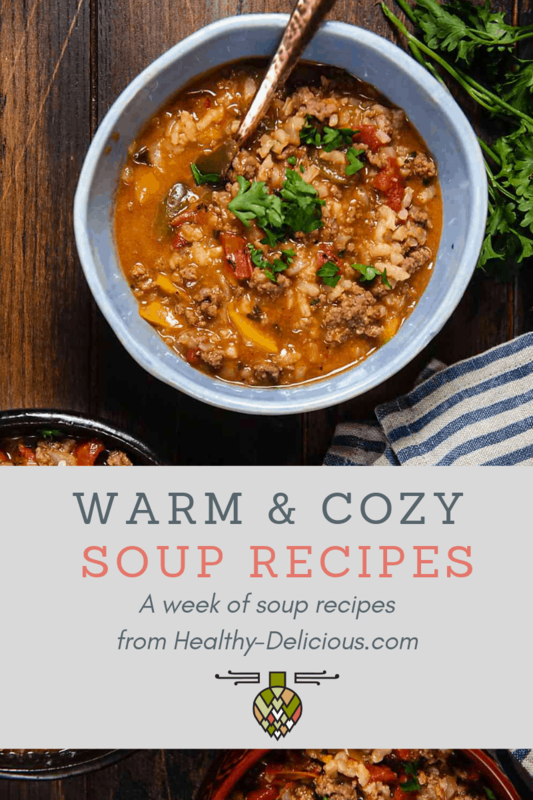 Remove from heat and let cool. Spoon the batter into the prepared muffin tin - each cup should be about half full. 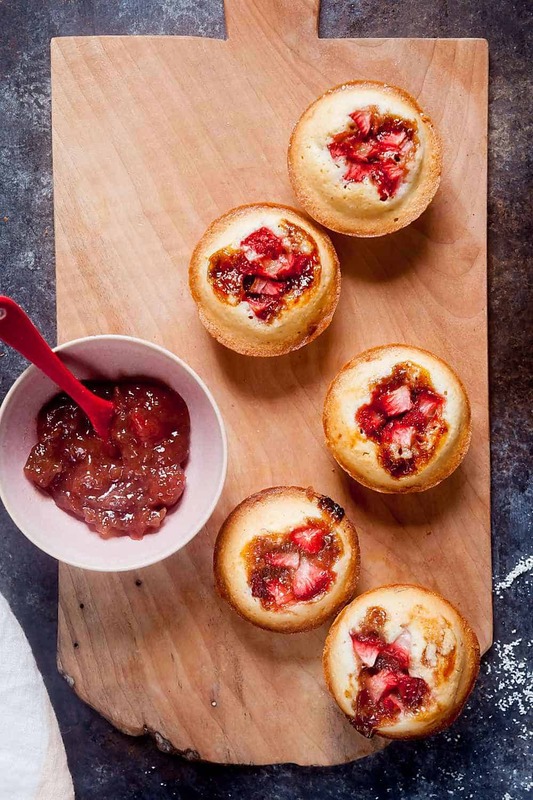 Top each financier with 1/2 teaspoon preserved and chopped strawberries. Bake 25-20 minutes, or until the edges are browned and the tops are set. White sugar gives these financiers gorgeous browned sides and pale tops, but you can substitute coconut flour if you prefer something less refined. These look so tasty! I’m so excited strawberry season is coming! I love the combination strawberry and rhubarb flavors! Thanks for sharing!!! Such a pretty Spring treat!